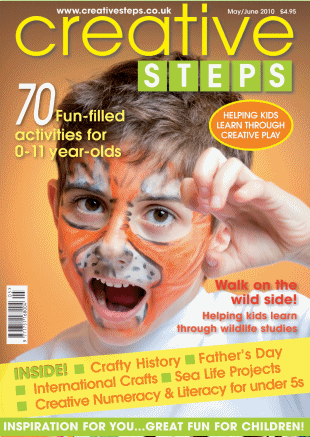 ISSUE 24 is packed with more than 70 fun-filled activities; including Father’s Day cards; gifts to make, wonderful ideas to help mark National Insect Week (21-27 June) and World Oceans Day (8 June), an extensive ‘Back to Nature’ feature in conjunction with The Wildlife Trusts, ideas to help explore The Vikings, along with science and fun cookery ideas for all! There’s a special feature to help engage young children by being Creative with Maths, plus a focus on Africa and ideas to encourage creative writing through role play. We’ve more than £500 worth of the latest great books, games and creative kits to be won in our free to enter competitions. All this, the regular features – including ’Four Ways with . . . drinking straws’ and Reading Corner, full sized printable templates and clear step-by-step instructions. DINO CARD – Roar ’Happy Father’s Day’ with a special card made from foam scraps. ALL CHANGE! – A useful collaged Father’s Day gift made from a plastic food tray! RIGHT ON TRACK! -A fun Father’s Day card and a great way for children to understand patterns using toy cars and paint. HAM & CHEESE MUFFINS – Tasty mini muffins which make a great savoury treat for both children and adults! COFFEE FILTER BUTTERFLIES – Little ones will be amazed as they watch the butterflies wings burst into colour. IT’S A BUG’S LIFE! – Celebrate National Insect Week with two easy-to-make bug favourites.. UNDERWATER PUPPETS – It’s World Oceans Day on June 8th, so why not have some fishy fun! SANDPAPER FISH – A great way for children to explore a different material and create an underwater collage. OCTOPUS HAT – Make your very own eight-tentacled friend with a few crafting essentials. FAB FOIL FRAME – A lovely project inspired by Tiffany glass and made from sweet wrappers and foil! WHAT’S IN THE BOX – Children love guessing games and this one helps develop their reasoning skills. LET’S BE CREATIVE WITH MATHS! – Hands-on maths activities and games can improve children’s concentration and confidence. AMAZING AFRICA! – Give children a taste of African culture with a colourful variety of projects.. COOKIES FOR DAD – A sporting treat – perfect for Father’s Day. They won’t hang around for long! SOCKTOPUS! – What do you call an octopus toy that is made out of an old sock? A Socktopus! ROCKET CARDS – Zoom into space on Father’s Day with two out-of-this-world cards..
STONEHENGE SUNSET – Capture the magic of the sunset with a 3D picture of Stonehenge. MIRROR FRAMES – Turn a simple mirror tile into a beautiful day at the seaside. TURTLE BOXES – Celebrate World Turtle Day on May 23rd and make your own little reptiles!. ROBOT SKITTLES – Recycle plastic dessert pots, add a few crafty scraps and make a knockout game! THE VIKINGS – The Vikings have landed! A special feature guaranteed to get kids hooked on history. ELECTRONIC BUGS – A colourful, hands-on experiment to help children understand conductivity. FABULOUS FELT! – A great project for older children who want to try out their sewing skills. A SPORTING LIFE! – Two great Father’s Day cards with a definite sporting theme! CHICKEN PASTA SALAD – This simple recipe is perfect for older children to make virtually unsupervised. It’s fun to make and tastes great! . ANIMAL MAGIC! – Cute finger puppets made from soft, furry felt and they require no sewing!. BRILLIANT BUTTERFLY! – Save those takeaway containers and turn them into fab garden ornaments. SAY IT WITH CLAY! – Use FIMO Soft clay and Push Moulds to create trendy cards and jewellery.